Nestled in the heart of the Cranborne Chase, The Old Forge is the perfect retreat for those looking to appreciate the slower pace of life. 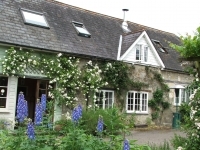 The 18th Century former Carriage and Wheelwrights workshops have been transformed to create a charming Bed and Breakfast and two self-catering cottages with unique appeal. Constantly evolving, recent years have seen the introduction of Sam the Shepherd's Hut and Rosie the 1934 Gypsy Caravan embracing the 'glamping' revolution.